Abura Soba (油そば) literally translates to “Oil Noodles”. Doesn’t sound all that appetizing, does it? Those who don’t know about this Tokyo cuisine might be confused by its name and appearance: it looks like a pile of noodles with a few toppings…… where is the soup? Give it a try, and you might be in for one of the most delicious and addictive types of ramen you have ever had. Where we are going today, we don’t need soup! Before I go further, I want to let you know that I LOVE ramen, and I believe that the spirit of a bowl of ramen lies within its soup. The soup is where the ramen masters took months and years to alter and adjust, creating the perfect ingredients harmony. If you ever eat ramen with me, you would know that I approve of the shop if I finish the whole bowl to its last drop of soup. With all that said, this soup-less ramen captured my heart from my first slurp. Abura Soba originated from the Kitatama district of Tokyo in the early 1950s. There are a few popular chains in the Kanto area that specialize in this type of noodles, and its popularity continues to grow. Abura soba is relatively easy to make as it doesn’t require a soup-base that takes half a day to prepare, and it costs only roughly 150yen per bowl to make as oppose to the 300yen for typical ramen. Therefore, more and more ramen shops are offering abura soba as an alternative menu item. Thanks to its cheap cost, it is also very common that you can get oomori (extra noodles) for no extra cost. To simply describe abura soba, it is a bowl of thick noodles with a special shouyu (soy sauce) and pork grease sauce placed at the bottom of the bowl. Typical toppings include: green onion, boiled bamboo shoot, seaweed, minced garlic and chashu pork, and the standard condiments of vinegar and chilli oil. Other common but optional additions include: sesame, black pepper, spicy preserved vegetables, more minced garlic, red ginger, boiled egg, raw egg, cheese, mayonnaise and spicy condiments like ichi-mi (chilli pepper powder) or even Toubanjan (Chinese spicy bean paste). As you can tell, a bowl of abura soba is very customizable, so you can enjoy it the way you fancy. Mix the noodles well with the sauce at the bottom of the bowl. (Optional) Add more chilli oil and vinegar to increase the flavour as you eat. Ask for complementary dashi (soup) or rice to mix into the left over sauce and finish up to the last drop (available depends on the shop). It’s not too difficult to grasp, is it? Add, mix, eat! With the sauce well blended with the noodles, the texture of the thick noodles feels greasy. You can taste the rich flavour of the sauce and the grease as you devour the noodles with guilt and satisfaction. The toppings serve as a change of pace and taste between your slurps, and a lot of people enjoy adding more and more condiments to strengthen the flavours as the meal goes on. Personally, my bowl of abura soba tends to get more sour and spicy as I eat on. I also recommend adding mayonnaise when you get close to the end of the noodles. It really changes the flavour and the texture, making it sweet and creamy. The raw egg, on the other hand, changes the texture a lot but not so much the taste. The bottom line is that you can and should experiment around with your abura soba to find your own preferred combination. At this point, some of you might be hungry but are worrying about the nutrition value. After all, we have been talking about its greasiness so much. Then perhaps you would be delighted to hear that a bowl of abura soba is relatively healthy compared to a bowl of ramen. 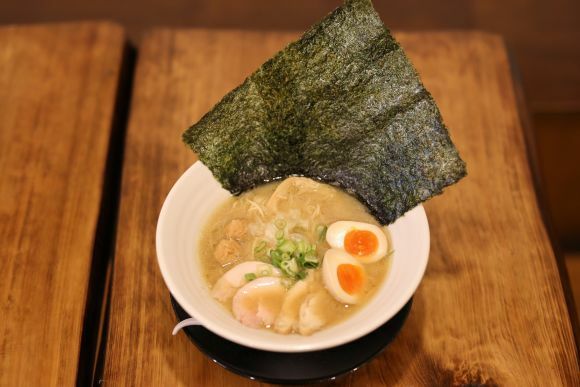 It contains a considerably less amount of sodium and less fat compared to the greasier types of ramen. Having that said, abura soba is stereotypically considered a “men’s” food with all the garlic and grease. It is definitely not a recommended cuisine to take your date to (speaking from personal experience)… unless your date is into it too, of course! If you are a fan of noodles or food with volume, this Tokyo cuisine with a growing popularity is a must-try. I hope you will give it a shot, experiment with it, and find your favourite way of eating Abura Soba. Enjoy! You Can Also Make Some Noodles Yourself!